Session #134 What is a Beer Garden? This month, Tom Cizaukas of Yours for Good Fermentables poses beer bloggers of the question What is a Beer Garden? Is it a specific type of place, or is it a feeling? It's not exactly an existential question, but it is something that baits a beer geek's sense of order. Beer writers classify the beverage into hundreds of styles, with very specific and at times subtle distinctions. We're all too happy to point out details that keep something true to style, and where it all goes wrong. Maybe this comes from beer's Teutonic heritage. Today's phrase of interest is appropriated from the German biergarten. I'll approach my discussion of the term by starting with the root, exploring traditions and alternative terms in it's native tongue, and then expounding upon the successes and failures of the American implementation and occasional misappropriation of the concept. First, let me begin by outlining my background and inherent biases. I like beer, and typically drink it indoors in places that are often dark. Sometimes I drink at home. I live outside of Boston. Our weather is characterized by noteworthy winters, and oppressive humidity in the summer. There are about 3 weeks a year that I would enjoy drinking outdoors, away from the water, in sunlight. Beer gardens, real or imagined, are not popular in this region. Yes, there are some nice decks on the ocean, patios, and al fresco dining, but I think we can all agree that these aren't quite the same as Germany's authentic biergartens. German is a language that loves to assemble words like legos, sticking terms together to imply an even more specific concept. While the word Biergarten is a simple merging of beer and yard, the concept is a bit more nuanced. At its root, the biergarten is an outdoor place to consume beer and food in a communal setting with a feeling of community. Biergartens come in a variety of sizes. They are usually attached to a brewery, pub or restaurant and can be found in parks, by castles and monuments. These are relaxed places to hang out with friends, make new ones, and eat and drink. Some parts of the garten may not have table service. It's acceptable to bring your own food and picnic. Everything is low key. 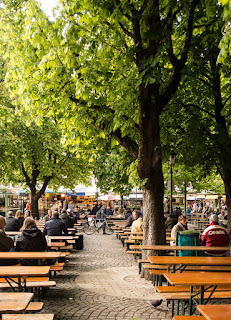 There's a german synonym wirtsgarten, or host-yard, indicating a an outdoor space where it's only permissible to consume the restaurant's food. The atmosphere may be similar to a proper biergarten. Some of these in include a back patio with a kitschy hop trellis. I like having two terms for the outdoor space, so that we can establish a lofty ideal state and describe places that get the idea but fall short for one reason or another. I'll submit that here in America we are better at building wirtsgartens than biergartens. The reasons may range from our exaggerated tastes for kitsch, protectionism, and puritanical regulatory statutes. It's baffling to me that marijuana legalization precedes lawful consumption of a beer on a park bench - but this is an aside about social engineering. Given America's general prohibition of open containers in public and semi-public spaces, one could argue that proper biergartens would flaunt our laws. An opponent might be describe beergardens as suited only to day drinking vagrants, and Europeans. Biergartens are charmingly vibrant at night. However, my favorite biergarten experiences have been in the afternoon. Typically after touristing for a morning, I have been delighted to sit down in some combination of sun and shade to enjoy a light lager, or hefeweisen. These are styles requiring some combination of patience and witchcraft, just beyond the grasp of the average American brewer. It's entirely possible that I perceive this scene to be the essential biergarten experience because it is entirely uncommon, if not impossible to have at home. There is definitely a comfortable feeling typical to traditional biergartens that must be a part of any successful transplant. There's even a word for this the relaxed and friendly vibe - Gemütlichkeit. It is the umami of beer culture, but a word with about 3 more syllables than Americans can comfortably appropriate without feeling pretentious. Our best tap-rooms have a sense of gemütlichkeit. Our beer gardens? Maybe. I've been to some nice beer gardens in the midwest, where the influence of German immigrants is strong, but most of the so called beer gardens I have experienced in the US are cramped, crowded, or obviously temporary festival installations. The spaces are optimized for commerce, not customer experience. Perhaps culturally, Americans have a preference for transactional relationships instead of communal. There is however a trend increasingly emphasizing the value of experiences over the price/quality of things. It's having a huge impact on the craft beer industry as fun breweries consume the market share of better breweries. This trend should inform the American approach to beer gardens. How Can We Make American Beer Gardens Great? We can transplant the beer garden experience by making our outdoor serving areas as open and welcoming as our statutes allow, and work to fix the prohibitory laws. Urban planners renewing neighborhoods, and reclaiming green space should consider adding a small snack bar and beer garden to parks, to keep the space vibrant later in the evening. A sense of openness. If a beergarden must be fenced, the area should be much wider than the fence is high. This is not a fortress, or an urban patio. A beergarden should not be under a roof. Umbrellas and plants offer the only protection from the elements. A touch of nature. Greenery is key. I like the old world approach with trees more than trellises. It would be helpful to use local flora and informally provide a sense of place. Dirt and grass floors are preferable to tile or crushed stone. Concrete is a borderline material. It should only be used if absolutely necessary. A sense of community. Structurally, this may be promoted with communal tables, low volume musical performers, games, a variety of food trucks, and a children's play area. Here are some tempting American ideas that can ruin the beer garden experience. Significant lines for beer. If the the line becomes a factor in whether or not to have another round, it is disrupting the low key vibe. New England IPA breweries, I'm looking at you. White Event Tents. These eye sores may sometimes be necessary, but they are never chill. Building one of these will transition a beergarden into a beer tent even if there are still seats outside. Limited seating. If a pub's outdoor seating area is the smaller than the interior, it's probably too small to call a garden. If the beergarden is exclusive, it misses the point. Too many beers over 5%. 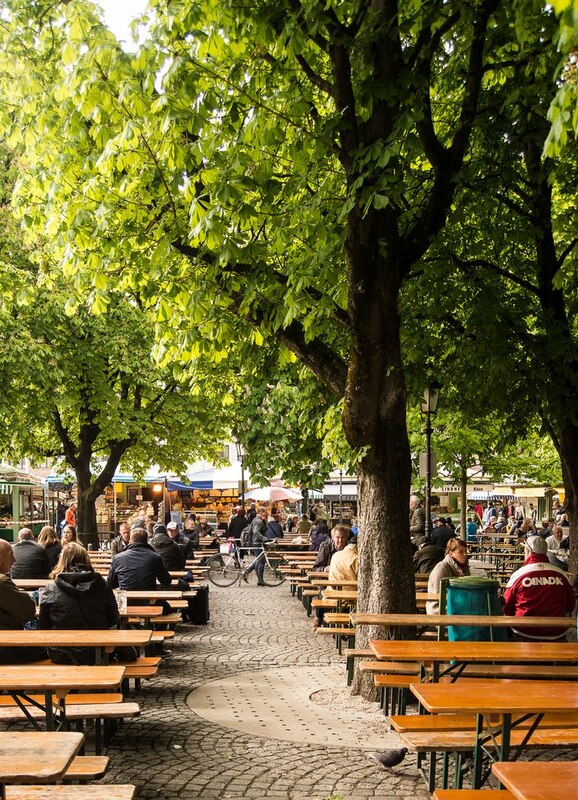 The relaxed environment of Germany's biergartens helped nurture and define that nation's beer culture. The tradition has been imported to America, but more typically commoditized as specific outdoor seating for a brewery or restaurant. Some are tacky, but some work quite nicely. As the american craft beer movement continues to embrace the idea of beer as a lifestyle beverage, and promotes improved experiences instead of better beer. The quality of beer gardens will be an increasing concern, and a point of differentiation. Better beer gardens will be more fun, and ultimately sell more beer.